During your stay in Puerto Vallarta transportation requirements will be dictated by where you are staying and where your intended destination is. Most of the time, you will have more than one option. Unless you plan to travel great distances or visit remote beaches, taxis and buses are by far the best way to get around. Taxis are plentiful, clean and reliable, and fares are reasonable and fixed (always ask what your fare will be before you get in). Taxis are usually lined up in front of most hotels. Your hotel can call a taxi for you. You can also rent a taxi for a couple hours at around 300 pesos per hour. This is a great way to see the area. Buses are available for most locations and each bus has a destination written on the windshield. The fare is about 4 pesos between the Marina and Old Town (connecting buses are available for destinations farther North and to Nayarit) and the fare is about 4.5 pesos South from Old Town as far as Boca de Tomatlan. There are bus stops in most areas and sometimes you'll be able to just flag these buses down as you are walking. The bus stop to go South from Old Town is located at the corner of Basilio Badillo (Restaurant Row) and Constitution on the Southeast corner. Most of these buses stop running at 11:00 p.m. so a taxi will be necessary after that time. This is the most inexpensive way to get around town. There is also a free trolley bus (donations only) which travels along the malec�n (beachwalk) and into Old Town. Rental cars are available from major rental car agencies. They have locations at the airport and in town. Another form of transportation are the pangas (small boats). Boat trips can be arranged to some of the exotic locales in Banderas Bay. There are water taxis available from Los Muertos Pier in Old Town to reach private beaches with no road access such as Yelapa, Quimixto or Las Animas. Tickets and schedules are available on the pier. Puerto Vallarta offers a great variety of accommodations - from 5 star luxury resorts to fantastic vacation villas to sensible, economy lodging. Location and ambiance is for you to decide. Go to sleep listening to the thump of the surf or walk to shops and restaurants. The choice is yours. Helpful Hints: Most hotels and resorts accept credit cards readily. On the other hand, the smaller and economy oriented ones do not. Some hotels will offer transportation services back to the airport - be it by taxi or a shuttle service. It is advisable to make arrangements the day prior to your departure. You may also be able to send and receive faxes at almost any hotel or resort. Most of the hotels and resorts have e-mail services or there are internet cafes in most locations. The tap water in most hotels and resorts is purified and drinkable. However, it is wise to clarify this at the time of your check-in. Many hotels will supply bottled water. Most of the economy lodging & backpacker crowd can be found downtown (Old Town) away from the water. This area is also very vibrant as there are many restaurants and markets nearby. By Air Flying is the most popular way to get to Puerto Vallarta. Gustavo D�az Ordaz International Airport (PVR) is located approximately 6 kilometers north of downtown. The newly remodeled airport has a bank, souvenir shops and restaurants. Car rentals are also available at the airport. 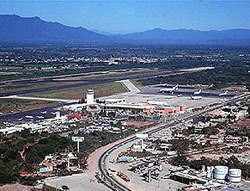 Most major Mexican & U.S. airlines fly into Puerto Vallarta. After clearing customs, go to the booth marked "TAXI" to pay for transportation and get a "ticket". These drivers will expect a "tip" because of their help with the luggage. Keep in mind that in normal Taxi transportation around the city, the tip is included in the price (unless the driver gives extra service). Car Rentals reservations can be made at the airport, before arriving or at some of the major hotels. Please see "Car Rentals" under Activities & Tours. Car rentals run from US$40-$110 daily. You will need to purchase Mexican vehicle insurance from the agencies. Most major rental companies are represented. Motorcycles and scooters may be available for rental also. Puerto Vallarta can be reached by public bus. First class (recommended) and second class buses leave and arrive from the new bus station North of the International Airport. Buses are one of Mexico's inexpensive ways to see the country. You can catch a bus to or from Tepic, Nayarit (3-3 1/2 hrs. ), Guadalajara (6-7 hrs.) and Manzanillo (6-7 hrs.) and points in between. Some vacationers do choose to drive from the U.S. or Mexico's major cities (Puerto Vallarta is only about 250 miles from the city of Guadalajara). Toll roads do lead to the vicinity of Puerto Vallarta and then turn into common two-lane highways. Never drive at night on these stretches of highway if possible. Wandering livestock, road problems and possible crime make day time driving safer. If you choose to drive your car or a rental car to the resort, please check with a Mexican consulate for all rules & regulations before you leave. Remember Mexican car insurance is mandatory. If you'd like to view the countryside and don't mind a little extra time "on the road", some visitors prefer the train. It can be caught out of Mexicali or Nogales along the border, or Mexico City to the southeast to Guadalajara or Tepic; then take the bus to Puerto Vallarta. If you plan to sail to Puerto Vallarta, you will need to follow all Mexican regulations for entering their territorial waters. Also, upon arriving at the marina or your anchorage, you'll need to submit your papers to the Captain of the Port for legal entry. Please contact the Mexican consulate nearest you.